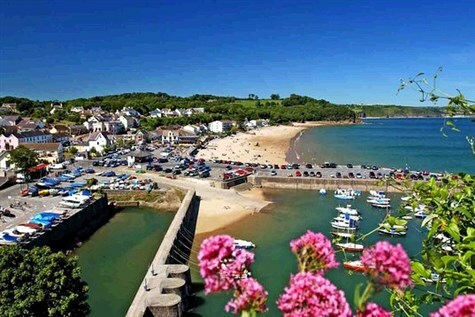 Saundersfoot has always been a popular tourist village on the Pembrokeshire Coast and now has an increasing reputation as a gourmet resort thanks to the high quality restaurants, cafes and the local Pembrokeshire produce. There is a wide sandy beach, pretty harbour and shops and cafes. PICTON CASTLE, THE SECRET OWL GARDEN and HAVERFORDWEST: Enjoy a guided tour of the castle and wander 40 acres of magnificent woodland and walled gardens. The Secret Owl Garden contains 25 different species of owls and throughout the dayeach owl if given the opportunity to fly freely around the garden. Haverfordwest is the attractive and ancient county town, dominated by the Western Cleddau that runs through the heart of the town, and the castlethat towers above it. PEMBROKE DOCK HERITAGE CENTRE, PEMBROKE AND SCENIC RIDE: situated at the Royal Dockyard Chapel, displays at the heritage centre tell the story of Pembroke, from its origins as Wales' only Royal Dockyard, where over 260 vessels were built including 5 Royal yachts. Later the RAF based squadrons of flying boats in the natural harbour and the town became the largest military flying boat station, playing a vital role in the Second World War Battle of the Atlantic. Pembroke is a charming walled town famous for its Norman Castle. Set in a commanding position, overlooking Saundersfoot and Carmarthen Bay. All ensuite rooms have TV, hairdryer and complimentary tea/coffeetray. The hotel has a bar, lounge, garden terrace, outdoor pool and games room. The hotel has no liftbut rooms on the ground and first floor.